Just seen that the order of this is all messed up. I will try to fix. Also, someone just let us know that a bunch of high res OCR versions of this have now been put online. So if people could give us a hand moving them into this library as well it would be much appreciated! I'm glad people are posting these, but how they are posted needs a lot of work. At the very least a picture of the cover of each issue needs to be added, a list of contents, and then tags of the subjects and authors needs to be added in. It's a lot of work, but without having searchable PDFs, doing it this way at least gives some indicator to people of what is in each issue. Also the order is screwed up still. I'll add jpg's of the covers for each issue which have a table of contents, and add tags for authors. Not sure why they're listed out of order though. Also for some reason the issues in volume 1 don't seem to be available although I uploaded them. A picture of the cover, while actually typing out the contents like I've done here is preferable. The order is messed up because they are not 'weighted' correctly. I can take care of that. Looks like there's some revisions that need to be approved in order for the PDFs that were attached to be visible. I can do that. I can also add a picture, list of contents, and tags to the odd numbered volumes, if you could take the even numbered ones. Again, thanks for uploading these. I've been reading through them as I go. OK, thanks Juan. I'll follow your lead and do the even ones. Thanks so much for your help with this, it's amazing! Looks like a lot of this is done, just a few more to go. I think I'm going to split off Living Marxism into a different parent article. 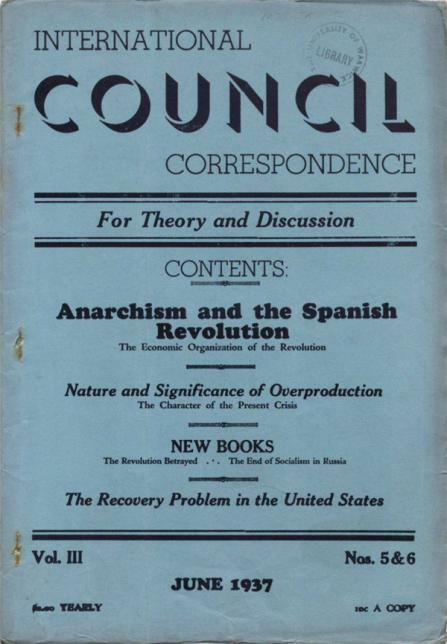 Right now it is labeled as International Council Correspondence, which is not accurate and could be confusing for people searching. It should then be done for anything that is New Essays as well. There's a case for keeping it all together given the continuity of the original project. Perhaps your concerns might better be addressed by editing the introduction text to explain the name changes, and tagging everything more clearly with the different titles. Splitting up the material might make it more difficult keep track of things. A lot of the separate articles from these journals seem to be getting put up at the link above as full text articles.